Coming into the season, you might have had a three-part checklist for Mariners’ lefty James Paxton. Can he throw more high fastballs, can he improve his changeup, and can he hold his velocity and command? We know his curve is good, and most years, he has the big velocity that has turned our attention to him. But these three items sum up the healthy skepticism that still remains, and the pitcher knows all about them. Jeff Sullivan recommended high fastballs for Paxton because his fastball has rise but he throws it low. Currently the Seattle lefty is showing almost exactly the same whiff and strikeout rates as he showed last year, so maybe he wasn’t listening. Except that he was! “I do utilize the high fastball, to work off of it, and have the curveball drop off it,” Paxton said of the fact that high fastball release points can help mask a high curveball release point. But the pitcher also admitted that the high fastball was “probably something I could work into my game a little more effectively.” He’s been trying, as you can see from the fastball heat maps below from Baseball Savant (2014 on the left, 2015 on the right). 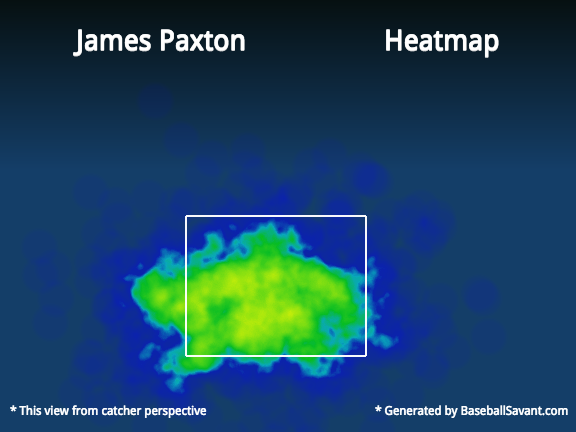 If you prefer numbers, Paxton has thrown 29% of his fastballs in the top third of the zone this year, up from 25% last year. And his rank with respect to his peers has changed, as he used to be in the 41st percentile for high fastballs, and so far this year, he’s in the 31st percentile. You might describe this as incremental progress. You might say the same for Paxton’s change. For one, he’s trusting it more. He threw 21 changeups against the Dodgers on April 13th, and he’d never thrown that many in one game before. He’s used the pitch about 18% of the time against righties this year, up from 11% last year. Trust alone is huge. Paxton said that when we call the changeup a feel pitch and wait for pitchers to transfer their bullpen change to the game, what we are talking about is confidence. “You normally throw off these primary two fingers and you really have to trust the ball to come off of these three fingers and still go where you go want it to go,” Paxton said of the changeup. The pitch itself? It’s got another half-inch of drop and fade, but it’s still an inch or two short of average movement. Still, the velocity gap is slightly above average. So far, including last year’s lesser changeup, he’s thrown 140+ changeups with a 16.8% whiff rate according to PITCHf/x. Even Brooks Baseball’s smaller number (12.5%) is basically average. Even as an average changeup, the pitch can help his overall mix work better by sitting between his cutter (90 mph) and curve (82 mph). So he should trust it more! He’s working on the cutter, too. Specifically, Paxton is “trying to get the release point for it.” You can see that his release point for the pitch (below, in green) is different than his other pitches, and that perhaps is he is getting around side the ball. That’s ironic, because he described the cutter as a pitch “where I’m just gripping it differently and throwing a fastball, not trying to get on the outside of it too much.” Perhaps he should consider the four-seam cut fastball instead. 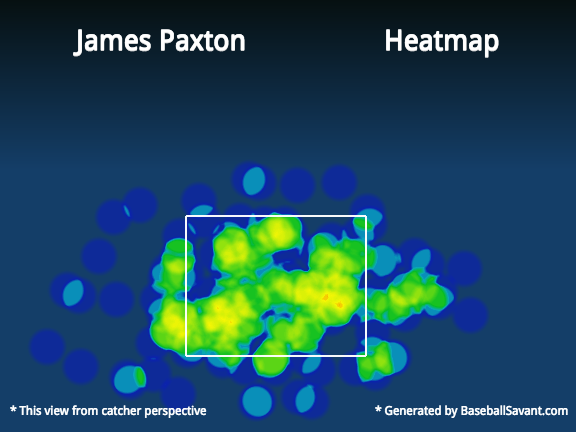 Other than a third pitch, consistency was the most-cited aspect of Paxton’s development on the way up. Command and velocity weren’t always there. There was a knee injury that turfed his velocity one season, but that wasn’t all of it. Both his command and velocity had to do with the repeatability of his delivery, the pitcher felt. 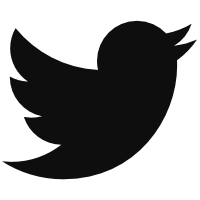 “I would lose power on some of my pitches because my direction would be going the wrong way. I’d be going towards third base… now I’m getting more of it going straight to the plate,” Paxton said. How does he go about correcting that problem? “Shortening up my back side. I wasn’t getting so long, it wouldn’t give me time to get off balance. A little more clean and compact. Shorter arm movement on my back side,” said the lefty of his keys. On the left is a 97 mph fastball from a September 2nd game against Oakland last year, in which he had his best average velocity of the year. 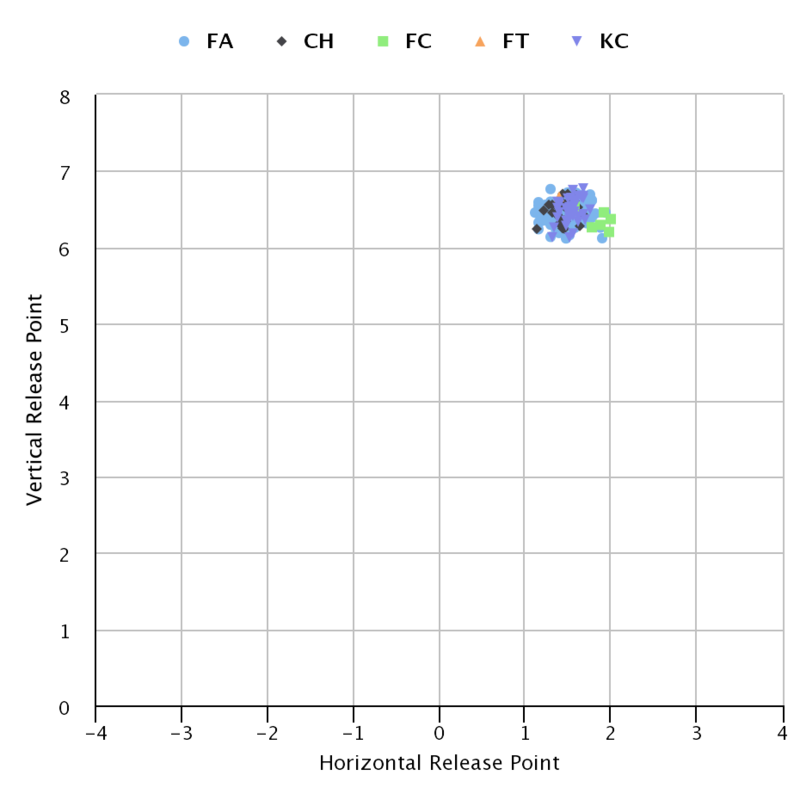 In the middle is a 90 mph fastball from a September 22nd game against Toronto last year, in which he had the worst average velocity of the year. On the right is a 92 mph fastball from a game against Texas this weekend. Let’s compare these, if we can considering the angles, to a video from his 2011 Futures Game appearance. It’s hard to tell if the path of his arm as it comes up has changed much. But if you freeze those GIFs above at front footfall, you can see that he doesn’t always get to the same spot with his upper body by that time. That’s high velocity on the left and low velocity on the right, and it looks like the ball is maybe higher relative to his neck on the left. There is something about the speed on the back side that is hugely important to Paxton, at least. So, if Paxton doesn’t completely go to the high fastball for more whiffs, it’s probably partially because of the ground-ball inducing aspect of his four-seamer. In the search for a third pitch, his trust for the change is almost good enough to believe in its quality. And when it comes to his mechanics,it seems that Paxton is aware of the most important aspects, and trying to refine them to the best of his abilities. The pitcher was talking about his changeup when he said “it’s just getting better and better all the time,” but maybe you could use the quote to describe his overall approach. Even with a few bumps in the road in the early going this year. 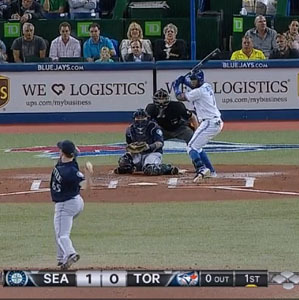 We hoped you liked reading Checking in With James Paxton by Eno Sarris! Great stuff, Eno. I own Paxton and watched the meltdown on Sunday against TEX. But could we really consider that a meltdown? 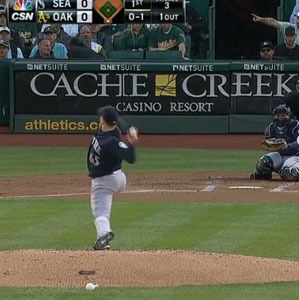 Bunt single, broken-bat error, seein-eye-single, and the highest chopped ball in history. It was frustrating to watch, and had to be frustrating to him. But your update on his makeup and analysis on his fastball brought me back to a good place.